Alcudia Beach gives you golden sand, a marina, great places to eat and drink and all kinds of water sports including kite-surfing and wind-surfing. If you prefer to be on the water rather than in it, you can go on a doughnut, banana boat or ski-tube. The Blue Flag beach stretches along the coastline for seven kilometres, shelving gently into the calm, clear shallow sea. Boat trips are widely available from the marina, and you can catch a ferry for a day trip to Menorca. If you fancy a few rounds of golf, head for The Alcanada Golf Club, which has the glamour factor with its clubhouse and restaurant in a converted mansion with stunning views of the 18 hole course.Alcudia Beach gives you golden sand, a marina, great places to eat and drink and all kinds of water sports including kite-surfing and wind-surfing. If you prefer to be on the water rather than in it, you can go on a doughnut, banana boat or ski-tube. The Blue Flag beach stretches along the coastline for seven kilometres, shelving gently into the calm, clear shallow sea. Boat trips are widely available from the marina, and you can catch a ferry for a day trip to Menorca. If you fancy a few rounds of golf, head for The Alcanada Golf Club, which has the glamour factor with its clubhouse and restaurant in a converted mansion with stunning views of the 18 hole course. The Roman town of Alcudia used to be Majorca’s capital. It is rich in history and culture. You will enter a world of narrow alleyways and small squares, Gothic churches, family-run shops, bars and restaurants. Parts of the town date back to around 1300. The vibrant market every Sunday and Tuesday just adds to the charm of the place. 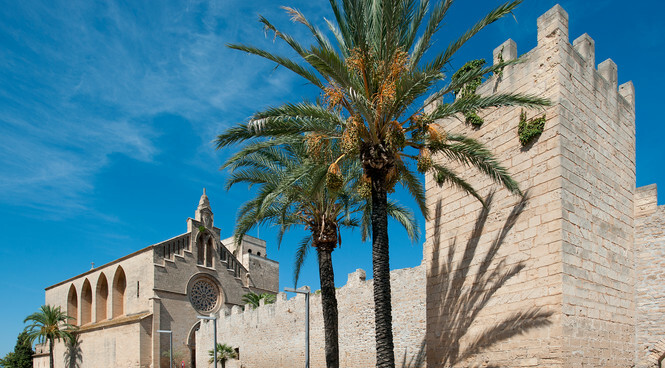 Alcudia has some great restaurants, old mansion houses and museums. Back in the 2nd century, Alcudia was occupied by the Romans – and you can visit what is left of their city, Pollentia. These are the best preserved Roman remains in Majorca, just outside the city walls. The remains include the residential district Portella, where the excavations have uncovered two streets and several houses, plus the Forum, and the public square where a few separate buildings have been found, such as the Capitol Temple. They include an unusual amphitheatre cut from solid rock. Museo de Pollensa is nearby, with an interesting collection of archaeological finds, including pottery, jewellery and a set of gladiator shin pads (no, you can’t try them on!) as well as paintings, Gothic sacred art and a pretty garden courtyard. Head south from Alcudia and you will find The Albufera Nature Reserve, a vital nesting site for birdlife, with wonderful sand dunes, lagoons, forests and wetlands, paths and trails. Walking here you can get up close and personal with over 400 different species of flora and 230 species of birds have been counted here (but not by us!) 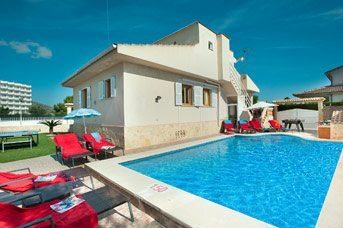 The entrance to the Reserve is 4 miles from the centre of Alcudia. Nightlife in Alcudia is lively. Vibrant Dollar Street is one of the hot spots where you can enjoy live music and karaoke in the lively bars and pubs as well as traditional games and quizzes. In this area you’ll find international bars, sports pubs, German beer gardens and Scottish and Irish bars – even the odd Spanish bar if you are lucky. The main night time tourist area is the Bellevue strip where you will find familiar places to eat, drink and shop.